A Syrian government warplane has crashed in a marketplace in the north-western town of Ariha, killing at least 27 people, activists say. The UK-based Syrian Observatory for Human Rights (SOHR) activist group said the crash occurred amid bombing raids. Ariha was one of the last government strongholds in Idlib when it was captured by Islamist rebels in May. The fall of Ariha left most of Idlib province, bordering Turkey, in rebel hands. Separately, Airwars, a journalist group that archives the US-led coalition's air campaign against the so-called Islamic State in Iraq and Syria, said that credible reports showed at least 489 civilians had been killed in the air strikes since August last year. In addition to those killed, the SOHR said at least 60 people had been injured in the Ariha incident. It is not clear whether the plane was shot down or crashed for another reason. The Local Co-ordination Committees (LCC), a network of opposition activists, posted an image online of what it said was the aftermath of the crash, showing huge damage to the marketplace and surrounding buildings. It said people were working to find survivors under the rubble and remove bodies. "The plane had dropped a bomb on the main bazaar street at low altitude only seconds before it crashed," Ghazal Abdullah, a resident close to the incident told Reuters. In January Syrian officials said at least 35 soldiers were killed in a cargo plane crash in Idlib province. State media blamed that crash on "weather conditions and heavy fog" but al-Nusra rebels, linked to al-Qaeda, said they had shot down the cargo plane. Idlib is now mostly in the hands of the Jaish al-Fateh (Army of Conquest) rebel alliance that includes al-Nusra. Idlib has borders with Turkey to the north and the Syrian province of Latakia to the west. Latakia is the heartland of President Bashar al-Assad's Alawite sect. Government forces have been fighting rebels in mountainous parts of Latakia, trying to prevent them reaching key coastal areas. Speaking on Monday in Qatar at a meeting with the Gulf Cooperation Council, US Secretary of State John Kerry blamed Mr Assad's government for the country's current militant insurgency, saying the "regime lost legitimacy long ago, in part because of its brutality against the Syrian people themselves". Mr Kerry said US policy on Syria remained clear - "to support the moderate Syrian opposition and remain relentless in our mission to eliminate the safe haven [Islamic State] has found in Syria". He reiterated that there could be no military solution in Syria and that a political solution had to be found. In its reporting of the coalition air campaign against IS in Iraq and Syria, Airwars said its "provisional view" was that from 8 August 2014 to 3 August 2015, "between 489 and 624 civilian non-combatants have been killed in 66 incidents where there is fair reporting publicly available of an event". 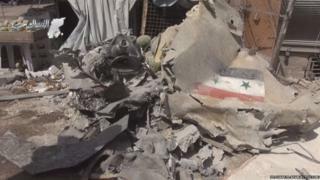 It said that only two civilian deaths had been conceded by the coalition.